This memoir/sociological analysis came out last summer, but Bob Moyer finds that it’s just as relevant now as it was during the thick of the presidential campaign. HILLBILLY ELEGY. By J.D. Vance. Harper. 261 pages. $27.99. 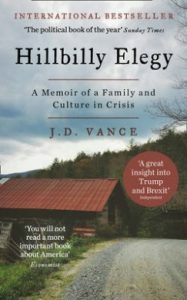 Vance has produced a remarkably poignant portrait of that Scots-Irish-Appalachian group known as hillbillies. He intends, he says, to portray the “spiritual and material poverty” that affects this oft-maligned, oft-ridiculed segment of the population, and why that condition remains chronic. With vivid detail, he describes how this “ancient family structure from the hills” did not thrive in the suburban setting they found themselves in when they made the journey up Route 23 from Kentucky to Ohio. That’s where Vance hails from. Born in Kentucky, raised in Ohio, he knows whereof he speaks. Growing up in the Rust Belt city of Middletown, Ohio, he experienced that much-studied milieu of single-parent homes and economic segregation that Middletown became. He also graduated from Yale Law School, and he brings a fierce, unsentimental ability to conflate his observations and experience with the many studies that have come down. In other words, he walks the walk and talks the talk with authority. Although he give some credence to the observation that factories around the country “…are going out of business and (the workers’) skill sets don’t fit well in the modern economy,” he lays part of the fault on the hillbilly himself. Vance blends personal experience into the cycle of lost opportunities in Middletown, as people can rise neither above nor out of poverty. He catalogues drug abuse, his mother being driven away in the back of a cop car, frequent moves just within the community, and the penchant on the part of a hillbilly to go from “…zero to murderous in a f*#@ing heartbeat.” Up against that negative force, he came out with an optimism which he credits to his own “god#@*n terminator,” his grandma. Not only did she provide him the succor that kept him going, as well as kept him from harm, but she also provides a few unintended moments of humor. In order to keep him away from a certain unsavory character, she threatens to run the kid over if she ever catches Vance with him again: “No one would ever find out,’ she whispered menacingly.” Both she and his grandfather were part of the “…loving handful of people” who rescued him. That’s it. No panaceas, no pronouncements, no prescriptions, just a clearly wrought conclusion with no fanfare. Vance makes clear that love and a stable place to live enabled his “escape.” Without sounding the least academic, he has produced a most profound sociological study of the dysfunction of the American working force, and the vicious cycle of poverty that makes it nigh onto impossible for people like him to escape it. He’s proud that he escaped it, but, to his credit, he’s also proud to be a hillbilly. That pride manifests itself in the deeply empathetic but pointedly accurate portrait that has put this book at the top of the best-seller list. This entry was posted in Contemporary Nonfiction, Memoir, Politics, Sociology and tagged Appalachia, hillbillies, J.D. Vance, sociological study. Bookmark the permalink.